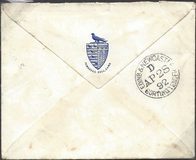 1859 2d Blue, SG 45, Plate 7. A vertical pair tied to cover to Dundee by very fine Edinburgh '131' duplex. 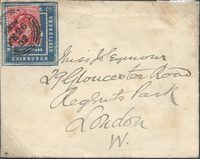 1897 Envelope to Edinburgh franked by a ½d Vermilion, SG 197, tied by a Kilmarnock cds, showing a very fine boxed "OF THE NATURE/OF A LETTER/131" and HANDSTRUCK '1' POSTAGE DUE OF EDINBURGH. 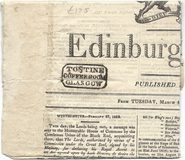 1859 2d Blue, SG 45, Plate 7, F-K, tied to cover to Dundee by a very fine Edinburgh '131' duplex. 1856 Entire to Crieff franked by a 1d Red-Brown, SG 29 tied by a very fine Edinburgh 131 ROLLER CANCELLATION. 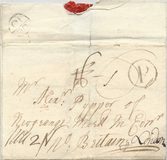 MAY 27TH 1840 1d MULREADY ENVELOPE, Forme 3, Stereo A167, addressed to Greenock and cancelled but a Superb EDINBURGH Maltese Cross. 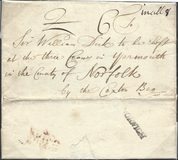 1840 Cover to Oban franked by a Pair of 1d BLACKS, SG 2, PLATE 1B, F-C/F-D, tied by two EDINBURGH MALTESE CROSS IN RED WITH BOXED 'PAID/1d EXTRA of EDINBURGH BELOW. LATE FEE CHARGE OF 1d.